Addends Towers In Full Motion. You have seen pictures and descriptions of addends towers and other games at Crewton Ramone's House of Math since pretty much day one, but here it is on video for the first time. This is a staple of Mortensen Math. 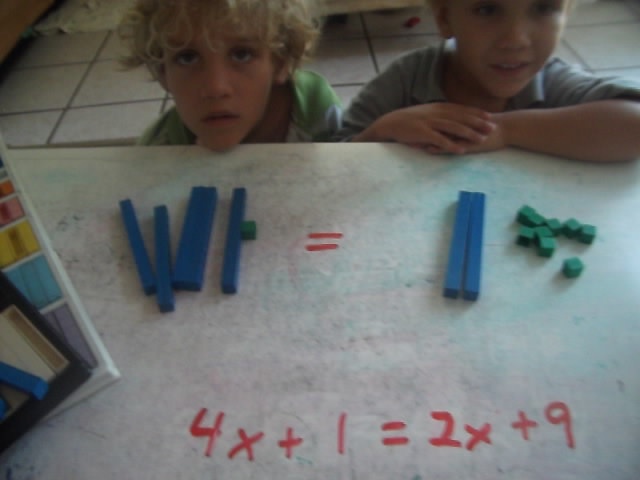 You HAVE to set the rules for the lesson: they have to build the levels with addends not just four 7's or whatever. 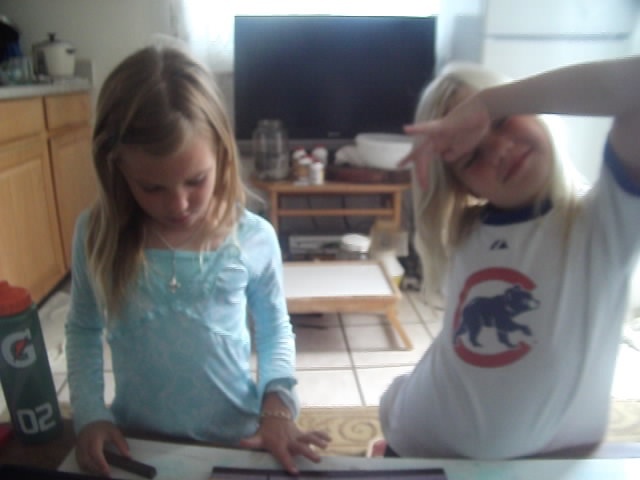 These two little girls are a ton of fun and a bit of a challenge when it comes to behavior management. 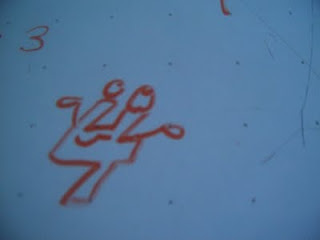 This was part of a lesson that engaged them the whole hour. At the end of it we did algebra but we barely got started and it was time to go...it felt like they were there for 5 or 10 minutes. Thus proving my own axiom to myself: "make it fun." With these two I just have to get a little more creative and keep things moving so te have little or no time to quarrel with each other...and certainly no time to get bored. I fully understand in a classroom situation you can't make it exciting every single minute, that would be exhausting for everybody; however, on the other hand some classrooms are so boring the kids get diagnosed with ADD or ADHD, they're not attention deficient, they bored to tears. Solution: drugs. I have a different solution. Engage the student with MRE's. Math Rich Environments. Make sure those MRE's are activity rich too. Book work is boring. Necessary, but boring for little kids. As they get older you will be moving to symbols anyway but at the younger ages they need hands on activities. Think of it the same way you think of teaching reading. In the beginning the books have a lot more pictures than words and gradually move to words, but by 7 there is still lots more page devoted to pictures than to words. And as always don't just use these powerful tools to teach addition and place value. You can use them to teach counting through calculus...and one day you will see that as I use algebra to teach counting you can use calculus to teach counting and multiplication too...so literally teach counting through calculus. The best way to start any lesson on Math Symbols is with a three period lesson. You may need to repeat it once or twice...it's important that they hear you read the symbols and that you add meaning as you go. Here is a synopsis of about 30 minutes of a lesson on some math symbols. We had also done this several times before. This student is Autistic which doesn't mean can't learn, it means takes more time and impressions to get info into the part of the brain where it can be recalled. This one is often missed by students who have made the rule hard and fast in their heads two negatives equal a positive: -|-3| because they don't understand the concept of absolute value and fail to read the math symbols correctly. When doing absolute value I often just talk about the block itself doesn't matter what side it's on a four block is "four" long. In her case though this explanation didn't sit as well because she wanted to be sure the block was on the positive side since all absolute values are positive. Other students seem to get the idea of "it's four from here to here" no matter which way you go. This also explains why the difference of two negative numbers is still positive. 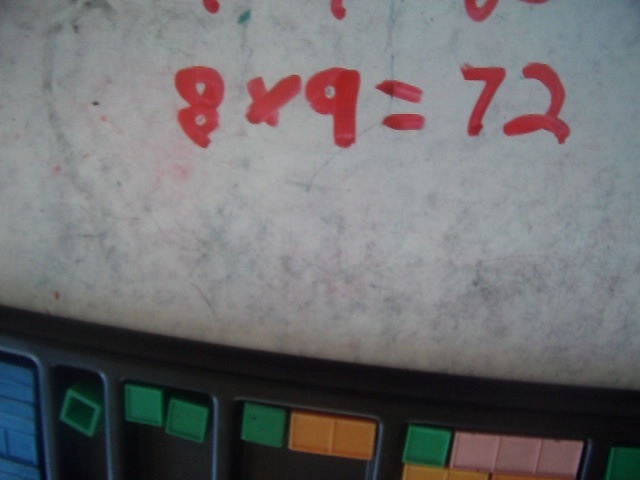 Bright young students might inquire why it is that -22 - -28 = 6 where all the numbers are negative and we're even subtracting! The answer somehow ends up positive. The difference can be explained in terms of direction on a number line, but as far as I have seen number lines and direction help confuse things, not clarify them. It's not about direction, it's about distance. The amount of "space" between the numbers, delineated by numbers themselves. Most kids don't ask. Might be wise not to bring it up especially with students who have poor self confidence in math. For the inquisitive ones and older students it can quickly devolve into a discussion on philosophy. How do you know the distance from here to here is four...? Keep it simple instead. 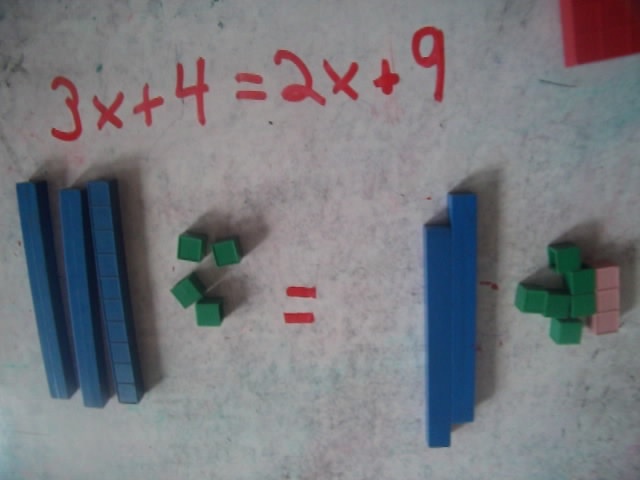 Explain what the math symbols mean and use blocks to bring the points home. Integers are no problem if presented properly. 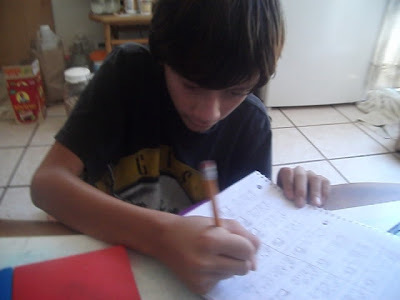 Look for more lessons on integers here on this blog and at the house of math where Sarah has her own page. The way I see it if you can explain it to Autistic students or little kids in a way they can understand then adults and older students as well as "gifted" students should be duck soup. Most of the time this is true. Often you have to get through math anxiety and other problems first with the older students. Bottom line keep it simple. I have made 100's of dollars re-explaining integers and reading symbols to all manner of students and have almost universally heard that using blocks makes it easier. Of late I have run into a lot of students who just want something to memorize rather than wanting to understand...understanding concepts is better. I used to keep a overhead slide of a Far Side Cartoon By Gary Larsen with me as I introduced my two hour lecture on Problem Solving. It showed a picture of the devil and a bunch of books; on closer inspection all the books were story problems and the caption read "Libraries in Hell". Of course the vid gets cut off at the very end. If you watch it we will see that Spaceman Spiff catches him after 3 minutes. How far away from the moon base are they when he does? An astounding 90+% of students can NOT do two stage problems, that is solve a problem to get the answer to another problem. Once I find X, I can evaluate the equations and see if they are same. In mathematics once we find one variable we can usually find other variables easily. If we understand the concepts. In calculus we study one and several variables. I used to start my pre-calc lecture where we just did linear algebra by asking the people in the room especially college graduates and teachers to give me a short definition of calculus anybody could understand. 99.99999% of the time none of them could. They might come up with some convoluted definition that even they were somewhat unsure of or come up with a very complex definition that they understood but when asked the rest of the room was not able to make sense of it...and I we would all laugh. This happened in cities from Maine to Maui and everywhere in between. The stress test was always could a little kid "get it." I have a simple definition. Look for it in an upcoming blog post meantime think of one for yourself if you've studied calculus. So we start off with X. Lets take this problem for example. 3x + 4 = 2x + 9 we can tell a story about Spaceman Spiff, or snowball fights, or we can just play with the blocks and add more meaning later. The idea is not to just give them a set of rules. Give them concepts and algorithms that make sense and that they can see in action. The basic concepts in use here are Hero Zero, No Fun Get Back To One and of course the rectangle. They can then use those concepts and algorithms to DO math, rather than just memorizing rules and process...which we have seen DOES NOT WORK. But who is in charge of math education? The 5% who easily memorized rules and process...see the problem? Good, because they don't. The problem solving page is starting to grow. There is also a Password Protected Problem Solving Page now with more stuff on it. There are tons of common, perennial classic, story problems that students get exposed to during their journey through mathematics. Rate and Distance, Boat and Stream, Percents, Mixture and Solution, (I have some 5% solution and some 12% solution, how much 12% solution do I have to mix with 5% solution to get 8% solution)...there also some like in the case of ordered pairs that they don't get exposed to and never get to understand. I know a ton of students that could not tell you that an ordered pair could be a story about a water tank or a doughnut factory and the resulting equation could be a graph of the production or amount of water as it fills the tank. All they "know" is slope intercept form, y = mx + b, and points on a graph. Half the time they can't remember which is the x and y axis. How this relates to a story about a tank of water or factory or anything else. I have a doughnut factory. After 3 hours, there were 16 cases of doughnuts, and after 8 hours, there were 31 cases of doughnuts how many cases where there to begin with and how many cases do they make per hour? That's the most basic story. You can do the same with a tank of water, after 3 hours 16 feet of water after 8 hours, 31 feet of water in the tank. How fast is the tank filling up and and how much water must have been in there to start? Then you can throw extra bells and whistles like the tank holds 40 feet of water how long does it take to fill? Go negative and drain the tank...use 39 and make them do fractions...but make sure the concepts are understood before you do any of that. You can find many amazing and easy ways to explain these in the Series A Manuals from Mortensen Math. Eventually, I will make videos of all of these kinds of problems but it takes time because I take the many steps in the degrees of difficulty...and don't just dive in and do the problems. Parents and Home schoolers seem to appreciate this, but it's driving some of the math teachers crazy. This method is slower at first but pretty soon it goes faster and faster until it surpasses traditional methods by far and you see little ten year old kids that seem like geniuses...it all starts with a game for 4 year olds called "what's under the cup?" There is also some problem solving going up on Sarah's Page. Nines seem to pose a bit of a problem for a lot of students but actually it's one of the easiest times tables because there are so many "tricks" you can use to count and multiply by nines. Here is another video showing yet another way to do it...there are more ways. 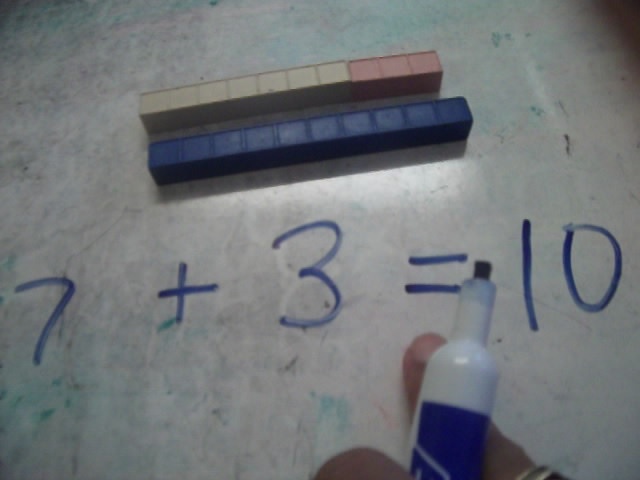 Here is counting by nines with younger students. There is a way to use your fingers too. I have to make a short vid on that one too...meantime here is a short post on a simple way to count rapidly by nines. Basically, we are playing advanced "what's under the cup?" but the name of this game is "finding stuff that's same on both sides." It's fun and even easier than "what's under the cup?" if you do it right. Start off easy and all positive and no fractional answers. The answers to problems like these are visually obvious. Once you remove the stuff that's same on both sides, this is a slightly more advanced problem because it involves hero zero AND no fun get back to one. The boys can see the answers and what to do. It's FUN when you get it right. Some observant people have noted there are 5x worth of manipulatives on the one side instead of 4, don't worry we sort it out in the longer video. Here is the short version where all they do is set up this problem, in the full video we solve this one and several more. 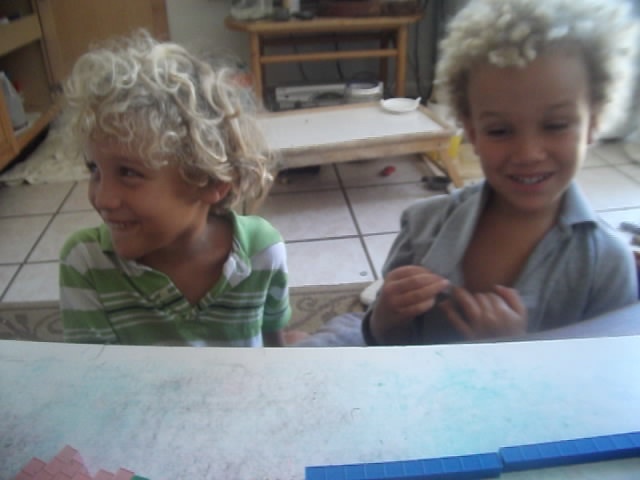 The boys say they are easy-peezy. I know several high school students who would beg to differ...as well as a few home school moms. Bob and Jay are out of town. Bob is trying to catch Jay. 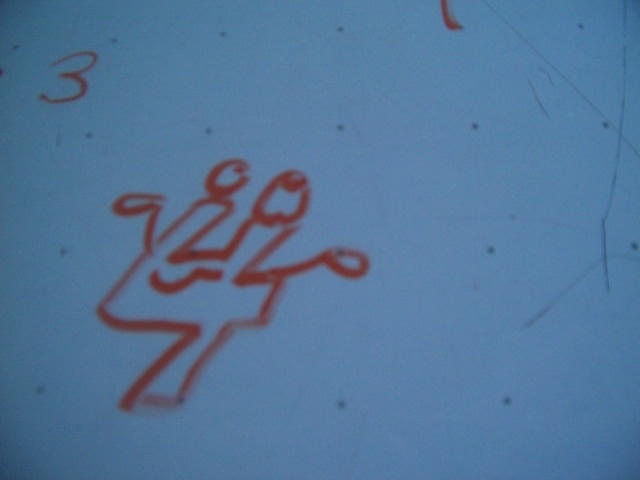 Bob is on his skate board going 4 miles an hour, Jay is walking along at 2 miles an hour. Bob is one mile out of town and Jay is 9 miles out of town. How long does it take Bob to catch Jay and how far out of town are they when he does? Or you could make it a little more difficult: Jay is walking at 2 miles an hour and is 9 miles out of town. Bob is only 1 mile out of town but is walking twice as fast. How long does it take Bob to catch Jay and how far out of town are they when he does? Bob and Jay are going to have a snow ball fight. Bob has 1 snow ball and Jay has 9, which isn't fair. So they each build more snowballs. Jay works for 2 minutes and Bob works for 4 minutes, they build the same amount of snowballs per minute and when they are done they each have the same amount of snow balls. How many snow balls do they have and how many did they make each minute? Be sure to check out the previous blog post on problem solving for more. And if you want to see the entire video get yourself a password and go here. 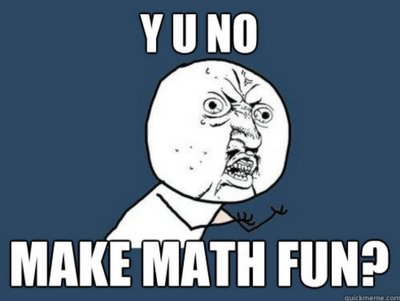 Math is more fun if you make a game of it. 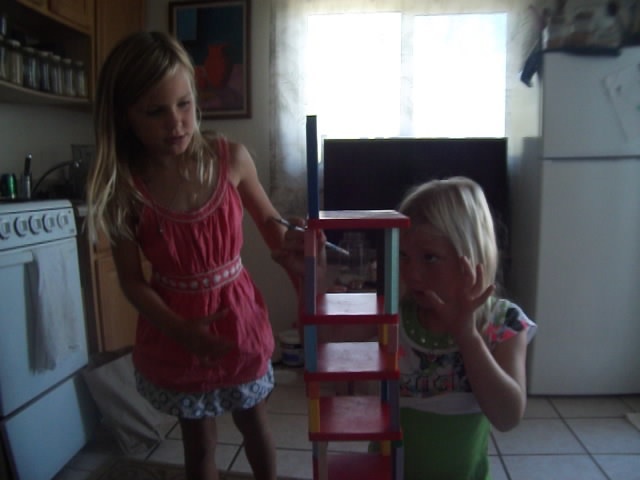 But eventually games are no fun if they are too easy and present no challenge. They are also no fun if they are too hard. There is a game called "what's under the cup?" that many think is just for little kids. The idea is to start easy then advance by degrees. You will find that pretty soon your students are doing some pretty "serious" algebra. The idea is to understand the concepts and the way you do that is obviously not to memorize a lot of rules and formula. In fact, you will see students begin to make up their own rules as they get better at playing "what's under the cup?" At first problems like these pose a challenge as the students are learning to count, and can pose a problem for some students when these are first introduced in 5th or 6th grade. They get confused with "inverse addends" and "inverse functions", as well as rules about walking across the equals sign...just tell me what has to be under the cup. Once this game becomes easy, you can move on to more advanced what's under the cup. Problem Solving is easy and you will see their thinking skills improve as they use their computation skills to start doing math via algebra. I thought this lesson was about 10 minutes long, turns out it's 25 minutes long. Times flies when your having math. The video above will be added to the Problem Solving page. Which is about to undergo a revamp...or I may have to add a another page or two. Meantime you can search "Crewton Ramone Problem Solving" in your favorite search engine or on Youtube. Look us up on Facebook and Twitter...you might consider a password as a donation. This project is pretty much 100% powered by passwords and some larger donations I have received. People are quick to send me emails asking questions, advice, and for videos on specific topics but pretty slow to send even three bucks. Those who buy combo kits or take lessons get free passwords and those who donate 25 bucks or more have found they get vids made for them pretty quickly and everybody gets a response to email eventually...some quicker than others, but I generally answer them all. If you already have base ten blocks or know somebody who does, make sure you let them know about this site and encourage them to get a password. Algebra is just generic math. We count stuff. That stuff has names. We can use it for lots of things. Problem solving. Honing our critical thinking skills. Learning to count. Simple stuff like that. This nine year old can already count, so all I'm doing is giving him new stuff to count. That stuff has names, like "x to the third" and "x squared" and "x", you can also teach kids who are just learning the names of numbers these too: it's just more vocabulary. Mostly I find that the teachers themselves are the ones who have a bias against counting "x to the thirds" due to their own ill experiences with math, but really, to little kids it's just counting. Little kids actually enjoy algebra because it's like learning with puzzles...the teacher can add more or less meaning as needed, depending on age and skill level. This little snippet may look impressive but if you watch the whole thing which is on the "advanced" algebra page you can see it was easy and fun and it was a natural progression. The child even made up the problem himself. I watched the long version of the video with a certain pair of students who were four and six and they made me stop the video so they could answer before the child in the video did. You can also do this with your students. I know three bucks is a lot to pay for a home made 22 minute video but you also get pdf's and access to literally 50+ more videos. Go crazy and spend 12 bucks and you get that access for a year and you'll see how much stuff I add weekly is worth a buck a month. It will be a while before we move into negative expressions and we still have to play around quite a bit before we start setting these equal to zero and solving them and then move on to graphing them. One step at a time. 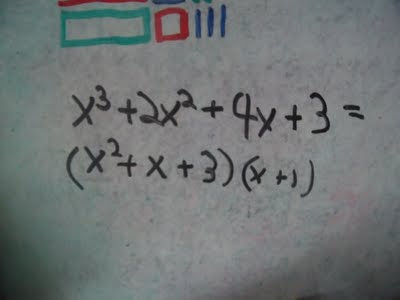 Also for homework you could take that last problem we did and draw it so that one side is x2 + 2x + 1 and the other is 3x + 2. You'll get the same thing just in a different shaped rectangle. There's often more than one way to factor third and fourth degree problems. Addition, Multiplication, Fractions and Algebra, Oh My! This is a short snippet from a video that's 26 minutes long which you can find on the sample lessons page. This is short and simple, all the lessons in this class were too. Math is always easy when you can see it and the concepts are "visually obvious". We started reducing fractions and SEEING the common factor, he was getting them all correct but then got snagged on this one. He only saw the symbols not the blocks as soon as they can see the blocks it's easy, and only requires the most basic counting skills. 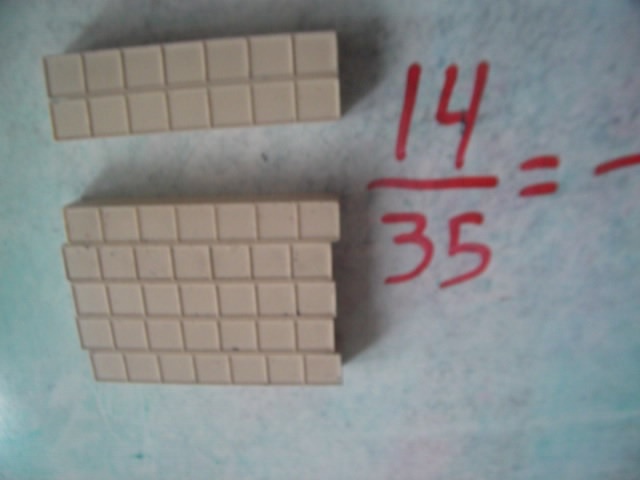 14/35 without the blocks requires some multiplication and/or division skills in order to discover the common factor. Then we moved on to other basic operations like addition and subtraction, and of course we played around a little in algebra, factoring polynomials. The whole video requires a password...although some people got a link to it free on Facebook. As you watch the longer video you should be able to see the five concepts in action and why I stress multiplication facts mastery. You need to be able to count quickly, and being able to do so will allow you to see patterns and relationships easily. For example 14/35 is the same as 2/5. Further, it's easy to see (2/5)(7/7) = 14/35 and of course (14/35)/(7/7) = 2/5. Later when the numbers are more complex, the basic concepts will remain the same. Also 2/5 = x/35 will also be easy. Anyhow, the 26 minute video is full of math; short lessons that should be easy for you to duplicate. They all blend together into what we call basic operations. For more go to the House Of Math. 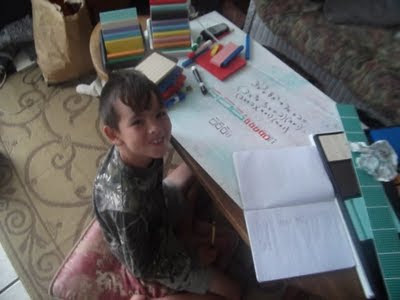 If you are new to all of this you can watch a short vid that shows what happens to little kids when they are taught this way, watch an overview of the Mortensen Math method and peruse a ton of videos on various topics. Crewton Ramone Math is Counting With Savmack. The twins who have both now figured out first had that having fun with math and fooling around are not exactly the same thing, and they both have the time outs to prove it had a great fast fun lesson with math. We learned a few concepts and mostly practiced what we already knew. We practiced addends, algebra and factoring also spent time seeing that multiplication and division "go together". The idea is to introduce simple concepts one or two at a time. that way it's never scary or overwhelming. Traditional approaches seem to confuse introducing concepts into bite size pieces with segmentation to the point where the whole is lost. You want to trickle feed the information but the feed has to be continuous and cohesive. What often ends up happening is reduction to the ridiculous where students get lost in computation without seeing the whole picture. They get confused and think computation IS math, instead of understanding that computation is part of doing math. Anyhow, the idea is to keep it simple and keep it at or below the child's level and add "challenges" as they are ready. The worst thing you can do is put a child in a position where they can't succeed. Note who they tell me how easy it is and this is the cue to make it a little harder using two red squares...they get it after a little work, and it's self correcting. Keep the basic concepts in mind as you introduce more math concepts. See what happens when this approach is used early on...here. This shot is from the end of the lesson where we squeeze in a couple of problems in Algebra, he factors a couple of polynomials. It's fun and easy and a nice break from "all the fractions stuff." This lesson brought home the point that multiplication makes ALL the other math easier because it allows you to count very quickly. You can do these problems without having multiplication facts down but it sure takes longer. Little kids who only have the ability to count should still be exposed to these concepts but the problems should be smaller and easier to count. The concept of one, common factors, and equivalent fractions and multiplication and division are all bundled up into one here and should be deconstructed for the student so they can see each part and how it goes together. This video covers the hour lesson from start to finish. We start with all 45 addends, move to multiplication mostly just to see his progress, and we do a little subtraction, he asks for help with fractions and so we do some and then end with algebra again the hour flies by. This vid is packed with concept rich content. You may notice that we discuss the basic concepts in passing as we go along. This is a longer video and I've found many people won't watch it as soon as they see the time. If you have children who are learning fractions concepts you may want to take the time at some point to show them this video as they will SEE the common factor and why it is that "as we do above so we do below." Rather than just giving the rule of dividing both the numerator and denominator by the same number. We we move on to more complex algebraic fractions the concept remains the same. My fractions page is still in disarray but you can find links and more vids there too, plus some PDF's, people seem to want fractions worksheets and I need to get more made, but there are a few there right now. Find me on Facebook, and Twitter and you might want to subscribe to my Youtube channel as many videos go there that don't make it here. You can find sessions that I document for parents and such. 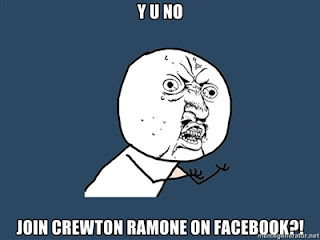 On the entire internet there is only one Crewton Ramone. Also now you can usually easily find follow up vids if you notice the P1 in front of the tittle...just go to the password pages and look for P2 and P3 with identical titles.